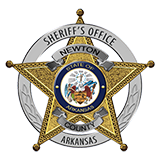 On June 29th, 2014, while following a lead received from a member of the public, deputies with the Newton County Sheriff's Office recovered a 2002 Jeep Cherokee that had been reported stolen in July, 2013 from a residence near Western Grove, Ark. The Jeep was located in the woods near Piercetown, Ark. and had been destroyed by fire. The VIN plates had been removed from the vehicle in an apparent attempt to keep authorities from identifying the vehicle. However an additional VIN, located elsewhere on the vehicle, confirmed it was the vehicle in question. The Newton County Sheriff's Office had recently received information that the vehicle was in the Piercetown area and had been repainted. The vehicle was gone from the alleged location when deputies arrived. It appears as if the vehicle was burned after this lead was investigated. Investigators do have several strong leads and have confirmed a person of interest and possible accomplices in the case. Sheriff Keith Slape said on Monday "We have very good information as to who might have recently been in possession of the Jeep. I feel confident about where this investigation is headed."